I think it’s safe to say that many gamers will have fond memories of Spiderman 2 on PS2, Xbox and Gamecube. It was the first game for many people that really made them feel like they were in a large living, breathing city: and the game is highly regarded for how it deals with Spiderman’s Web-slinging, the quality of which games have failed to replicate ever since. But now we have a new contender for it in Insomniac’s adaption of our friendly neighborhood Spiderman, in Marvel’s Spiderman on PS4. THIS IS NOT A SINISTER SIX FOCUSED STORY. For the majority of the story, You will focus on only the Demons. The Sinister Six do appear later on, as teased earlier in this years E3, but only after two thirds of the story have been completed. The narrative in this game is well written, Peter has instant charm and charisma on his side, and his chemistry with MJ and Aunt May is superb. The facial animation on the characters is detailed, but suffers from a similar problem that Injustice 2 had- the characters all have that slight look to them that prevents them from only just crossing over that uncanny valley. Although, unlike Injustice 2, you don’t notice it too often. There are scenes with genuine impact and pathos here, some will hold surprises and curve-balls that will make you dance in your seat, whereas others will make you want to hug a pillow and reach for tissues through tears. There are a couple of reveals you do see coming, as the game will heavily hint toward them, to the point where it sometimes feels like it might as well just be blaring it through a PA system- in your face. That said it is still a genuinely well made and executed story and none-the-less enjoyable. There is also one very minor plot-hole I noticed that was very irritating. But like I’ve said, it was very minor and does not ruin the story. The gameplay is satisfying, but the combat borrows heavily from the Batman Arkham series. It follows the system of having both a punch and dodge system. Instead of blue/yellow/red lighting above Batman’s head, you’ll see a white semicircle “spider-sense” above Spider man’s head whenever you need to dodge out of the way of something. Thankfully, they have put their spin on it. Instead of the dodge button being an easy counter, you are still required to choose which direction you dodge in. If you’re not careful about this, that you can be still hit by certain attacks. You can also press Triangle to grapple yourself to enemy with your web-shooters. Later on you can even get an upgrade that allows you to throw them at other goons when you uppercut them into the air. Enemy types are incredibly varied, the obligatory melee and heavy enemies, some goons with guns, rocket-launchers, but also swords, whips, jet-packs and super-natural powers make an appearance. Web-slinging, dodging and attacking also charge up whats called your “Focus Meter”, This allows you to use special finishers on enemies, or drain it to heal yourself when in a bind. Spiderman’s suits also carry with them special mods that affect damage you inflict, or give you certain bonuses, in addition to super moves that can trigger after a cool-down period. One generates your focus meter for a short period of time, another stops enemies for calling for backup, and one other one can deal a bunch of damage with a large energy blast to surrounding enemies. Stealth is again inspired by the Batman Arkham games. You perch on the edge buildings, structural supports or lamp-posts, and begin cocooning them in web,dangling them from the aforementioned ledge. The differences are that you can grapple yourself to enemies, sometimes knocking them out in one hit. You can also use a myriad of gadgets to create distractions, stealthily attack enemies, or aid you in combat. In addition to this, You can also use crawling on the walls and ceilings to your advantage, although the game does a bad job of teaching you how to climb walls. It teaches you that walking up to walls when standing up normally will make Spiderman stick to it. But it doesn’t tell you you can aim and fire at the wall to slingshot yourself onto it like you can the ceiling. As a result, I spent the majority of the game awkwardly trying to swing/face-plant into a wall to be near the top, without having to crawl ridiculously slow up all the way (or running so fast I’d over-shoot it and launch off the top) to where I wanted to be. No matter what though, when crawling and not running up walls, Spiderman will sometimes get caught on the slightest slabs of wall. The only way to get past them is to either run, or jump of the wall, which usually makes you just bounce off of the wall and lose altitude. To break up the punch ups, you’ll also play through mandatory stealth missions as both MJ and Miles Morales. MJ’s sections I adored, but I detested Miles’ gameplay by the end. MJ has these really intriguing stealth sections in which she’ll do her own digging into the Demon’s or for other bits of information to aid Peter. There’s a nice drip feed of mechanics as the sections go on, beginning with really basic cover based stealth, until you have distractions you can make by pushing or turning on objects, by throwing a gadget that attracts enemies, environmental items that generate noise like glass, as well as a taser at the very end to quietly take out enemies. She will often have puzzles to solve involving clues and items around her, but most of all, her sections always serve some purpose to the story, and are fun to play. There’s only one section where I feel it wasn’t needed. At one point in a mission, you order around Spiderman on the ground, indicating distractions to make and enemies to take out. But I think it would have made more sense -and would be more fun-, to play as Spiderman himself, before switching back to MJ for an important story-related puzzle. Miles on the other hand, I hated- despised- outright DETESTED his sections. He only has three missions, one of which is a very basic stealth section that ends very quickly. He only has one mechanic, which is to hack tech nearby, but none of it is satisfying. You don’t have to find some way to sneak to it, you just aim and hold down a button, then move to the next area, that’s it. In the end, his sections were just dull and tedious. Speaking of the open world, it feels large and is densely packed with collectibles to find. 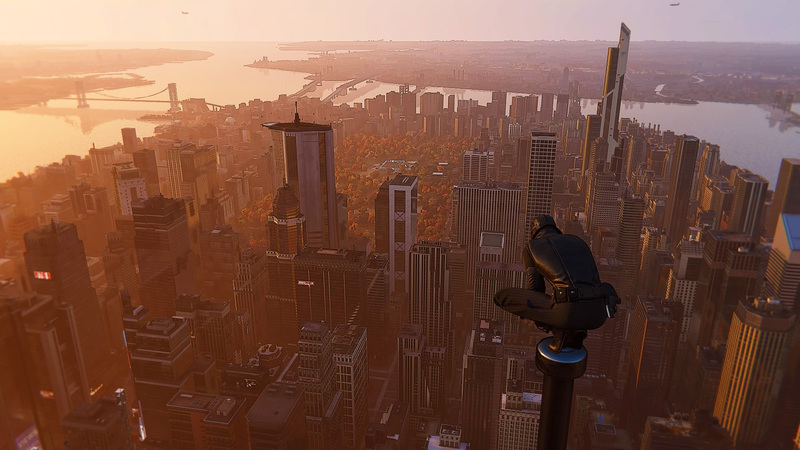 Backpacks webbed to the walls of buildings with items from Peter Parker’s past as Spiderman, Landmarks to take photos of, Black Cat stakeouts, as well as optional side missions. These of which can be randomly generated police alerts, with robberies, car chases, kidnappings, shootouts, or even car accidents with people to save. There are gang bases to take down, challenges to complete that entail taking care of a collection of bombs, scientific components and compounds to make at Peter’s work, and Oscorp research stations to monitor pollution. Oh, and then you have normal stand-alone side missions.By doing these side missions, you’ll earn various types of tokens, which go into crafting new gadgets, upgrades and suits. Speaking of the suits, many of them will please die-hard Spiderman fans, some being taken out of the comics, and a handful out of the recent MCU films. Some are more wacky than others though. They will require you however to complete certain sections of the story, get an entire set of collectibles or reach a certain level, before they’re even available to craft. Talk about a long checklist for completionists. Shame though that the story isn’t all that long. In the interest of time i tried to get through the campaign, aiming to get up to near the third act before writing the review, until I realized the game’s story was so short I might as well finish it. It took a bit above 15 hours maybe to complete on normal difficulty. This to me is really worrying. It means the story is concise and laser focused, but it does mean the game has less longevity, especially as I personally don’t enjoy some of the open world stuff, such as taking photos of NYC landmarks. Insomniac have said they are adding a New Game Plus mode soon, so there is that. The difficulty also really fluctuates throughout. None of the boss battles were particularly challenging. And they didn’t have many unique weaknesses. The majority of them either ask you to “Use your webs and gadgets to stun them!” or have you throw things at them. Only one boss fight has you having to time dropping things from above on an enemy as they charge at you, and it’s really the one of the only unique boss fights, but even then, it was still easy: I only died maybe a couple times in total in these boss fights. Sometimes however, there’d be one section here or there where i would die countless times, often because they put so many enemies of varying types and attack patterns, that no matter where you dodge, you’ll just put yourself in the way of someone else’s attack. Another problem with dodging is that sometimes with the lighting, color scheme of the location, and having so many other things to look at, you often don’t see the “Spider-sense” in time to do anything about it. This is helped somewhat when two upgrades allow time to be sometimes slowed down, or make it go blue after a bit, but even these didn’t seem to help that much. The slow-mo doesn’t trigger for every instance, and the blue color change can still blend in with a lot of locations in the story missions. And the bugs: they are there. Not many, but they are there. At one point, a major villain that was looking for me as Miles glitched out, and A. Just continuously walked along a wall, allowing me to run past him with no consequence, but also B. didn’t throw something he was supposed to, that would have let me progress into the next area. This was fixed with a checkpoint reload, but it was still annoying and jarring. Once, a police officer in a side mission, who was supposed to be having is stomach kicked by gang in a cut scene, didn’t actually appear until gameplay had started. Another time, train tracks that were supposed to be lifted to move a train out of tunnel didn’t lift- At least I assume it was supposed to be the train tracks, the web just moved up above it, but were clearly meant to be attached to something other than thin air. It’s odd: I don’t think I’d be so annoyed and irritated with this game, if it hadn’t been for one thing: That insomniac said they were “finished” in July… IT IS NOT FINISHED. I’m sorry but frankly, it isn’t. For one, something like a new game plus mode should ideally be in the game from day one, but whilst that is forgivable, For a game to be considered finished, I would expect at the very least that the difficulty curve is, well, a difficulty curve, and not just a straight line with a few high spikes. Those spikes weren’t even on boss fights either, none of the boss fights felt particularly challenging! I found myself increasingly frustrated and irritated toward the end, Plus the fact that they already started developing DLC before the game came out peeves me so much considering the work they clearly still had to do on the base game. There is also a fair amount of sequel baiting, with some story threads left un-tied and teased in both a mid-credits and after-credits scene. Marvel’s Spiderman is not a bad game and I do not regret my time with it, I want to make that very clear. it’s a fun and enjoyable game that finally gives Spidey his best game since 2004, and I will absolutely try to unlock all the suits, but it is incredibly disappointing after being promised so much more. Next Next post: The Walking Dead: The Final Season Cancelled, After Telltale Begins To Close Doors.